So it goes...: How Deep is the Gene Pool? This is a picture of my dad's side to the family. It is a classic old photo, one that tells a hundred stories just at first glance. I'd seen it at my brother Tom's house and asked if I could get a copy. It is one that is far too precious to let slip away. 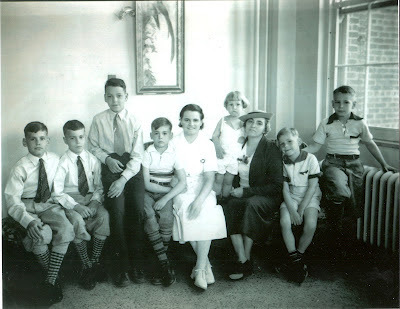 Like much of my dad's side of the family, I don't know all the details behind the photo. I'll tell what I do know and let the family correct the errors as they read it. It's interesting that my grandfather is not in the picture. I don't know if that was by choice, or if he was taking the picture, or what. The other interesting story about this picture is Jim's haircut. The rumor is that grandma always wanted a second girl and never got one, so she let him grow his hair long to get the little girl she always wanted. Don't know if that's the real story or not, but that's what I heard. Looking at the grown and in many cases now, passed on, uncles it was pretty easy for me to associate each of me an my brothers with one of the uncles. My brother Tom, somewhat ironically, would have to be matched up to Uncle Tom. They both love to fish and hunt and both are strongly stoic. Rob was most like Uncle Dan. Stunning good looks and a socialite that just attracted people to him. Million dollar smiles and strong personalities. Paul is most like my father I guess. Both have similar share some personalities and are rugged individualists. Paul has a flair for art and music that I don't think my dad had, but I may be wrong about that. My assertions were all confirmed as correct by my sister Jane, with the exception of me. She thought the one I would be associated with was Uncle Harry. I'm curious why she thinks that, but at the same time people are entitled to their own opinions. It would be interesting to see what the rest of the family thinks. The picture is one that evokes innocence, simpleness and old-fashioned family values. It was before the days of Internet, cable TV, cell phones and all the busyness that goes with it. You can almost smell the bread in the oven from looking at it. While it makes me feel good, very good, I did notice that grandma isn't smiling. With 8 kids to get ready for a photo like this, I totally understand why.